Last weekend, Ruth from RocknRollerBaby and I headed off on a whirlwind road trip to Wales, sans bebes, which was a bit of a treat. My love affair with Wales is well publicised on this here blog (here, here, here and here are a few posts, if you fancy reading about some of me and the kiddos' past Welsh adventures) so when Visit Wales approached me to work with them on their #FindYourEpic campaign I didn't need asking twice! The thing I love most about Wales, aside from the lovely people and the amazing food (laverbread! Welsh cakes! Nick Tonkins Wild Welsh Honey - which, I have to inform you, is THE BEST HONEY IN ALL THE LAND!) is the breathtaking rugged coastline and the beautiful rolling countryside. I've travelled around the British Isles a fair bit and the west coast of Wales really takes some beating. Yes, there are plenty of towns and cities (which I also love) but the vast majority of the coast and countryside is raw, unspoiled perfection. Whenever we visit our family in South Wales, we literally spend all our waking hours outside - on the beach, hiking, visiting castles (bar a couple of hours here and there which we spend in the pub, of course). When the sun shines in Wales it is absolutely incredible, but I love it equally (possibly even more so) when its blustery and grey. So last Friday, Ruth and I set off on our epic road trip and headed to Pembrokeshire. We were booked in to stay at Glebe House B&B in the village of Nolton, and had plans to hike on Friday afternoon and Saturday morning, before going beach riding on Saturday afternoon. Four and a half hours (and two numb bums) later, driving through the picturesque village of Nolton was like arriving at the gates of heaven. 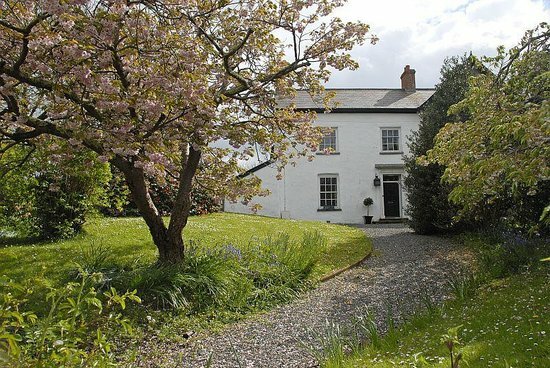 Dating back to 1352, and overlooking the ancient and picturesque church of St Madoc, Glebe House is, without doubt, the prettiest house in the village. It has four bedrooms, each named after local islands, and Ruth and I were staying in the Caldey room which was beautifully decorated, with thick black-out curtains, sumptuous bedding and lots of gorgeous finishing touches, like a big old fashioned cast iron radiator and a digital Roberts radio. There was also a huge claw foot bath in the en suite (as well as quite possibly the best, most powerful shower I've ever had in my life - and goodies from The White Company!) and a gorgeous view of the churchyard. After dropping our things off and having a quick freshen up, we decided not to waste any precious time and so headed straight out. We had a table booked at The Druidstone Hotel for dinner, which was half an hour's walk away along the coastal road. 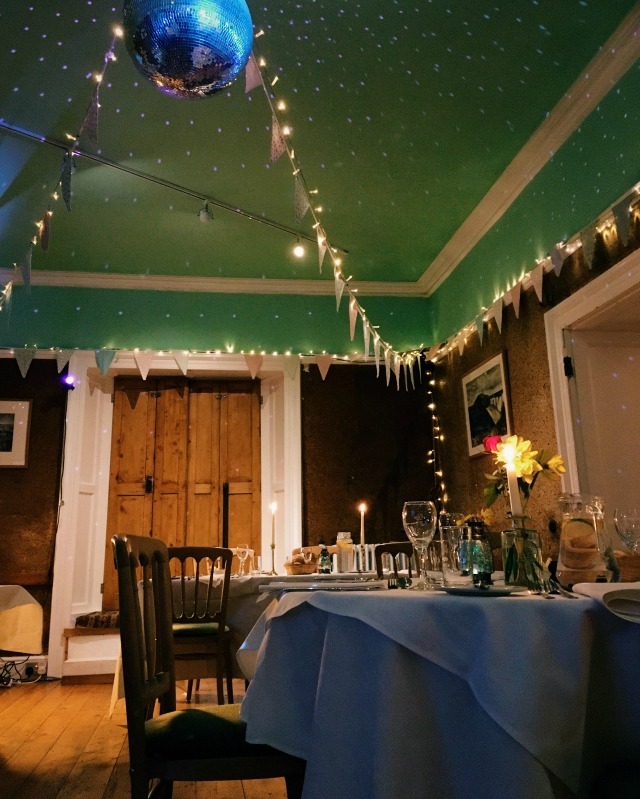 If you're ever passing through Pembrokeshire and want a brilliant, beautiful, awesome, quirky place to eat/drink/stay then PLEASE promise me you'll call in at The Dru. It's a big old house on the edge of a cliff, with a cosy bar, a beautiful dining room and seriously impressive views across the Atlantic. The hotel had a ceilidh planned for the next night, which meant we got to listen in on the band rehearsing after our dinner. It was brilliant - and made us wish we were staying longer! The following morning we were up bright and early to make the most out of our day. After nursing our slightly delicate heads with cups of tea, and filling our bellies with eggs and bacon, and jam on toast, we headed out on a coastal hike. I've spent the last six months planning a road trip of the west coast of Wales for this summer, and if the rest of it is anything like the teeny tiny bit we explored this weekend then I know I won't be disappointed. Then, for the main event. Horse riding on Druidstone Beach! The ride was organised by Nolton Stables, who also offer countryside rides and one to one lessons. They have a large selection of horses and ponies so they can cater for riders of all ages and levels of experience. Ruth was paired with Thunder, and my steed for the afternoon was Phantom! This post was written in collaboration with Visit Wales.